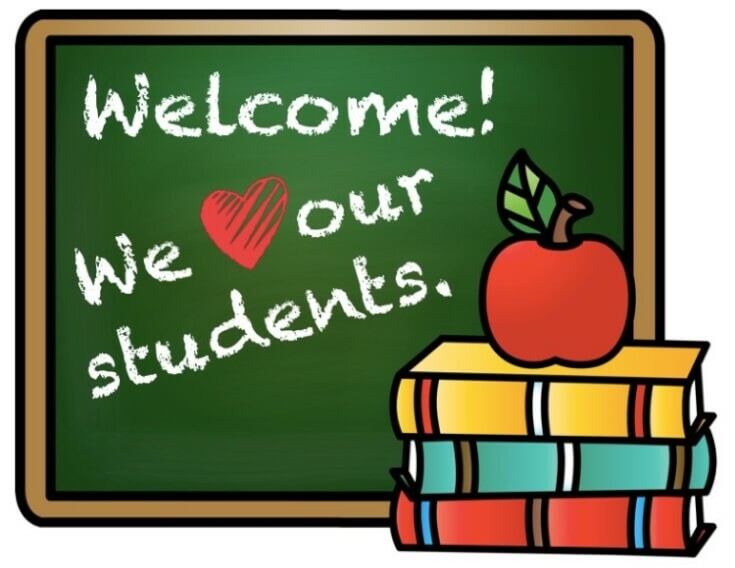 Back to School is around the corner and as the mom of a kindergartener, I attended a Parent Teacher conference where the teacher explained that there are lots of ways for parents to help out at school. I was super excited to learn that there were so many ways I can help out, and I learned about the Box Tops for Education program. To download these printables, click the yellow button below. If you’ve never heard about the Box Tops for Education program, you’re in the right place! Box Tops can be found on a wide variety of grocery items throughout your local supermarket or grocery store. Hundreds of products participate in the program, and you probably already have several in your pantry, freezer and fridge. For every Box Top you clip, your child’s school will receive 10 cents. That may not sound like a lot, but it adds up quickly. 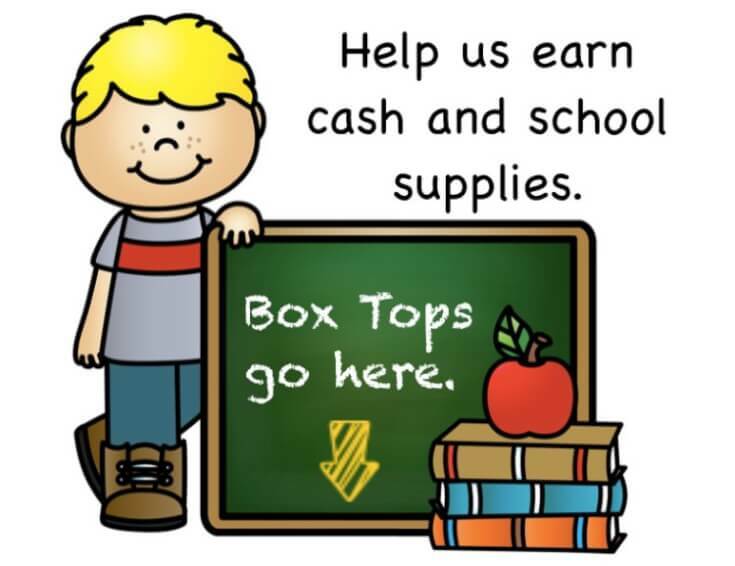 Each school can receive up to $20,000 per school year from clipped Box Tops. Even more good news – now you can get 5 times the box tops on certain featured products at Walmart. 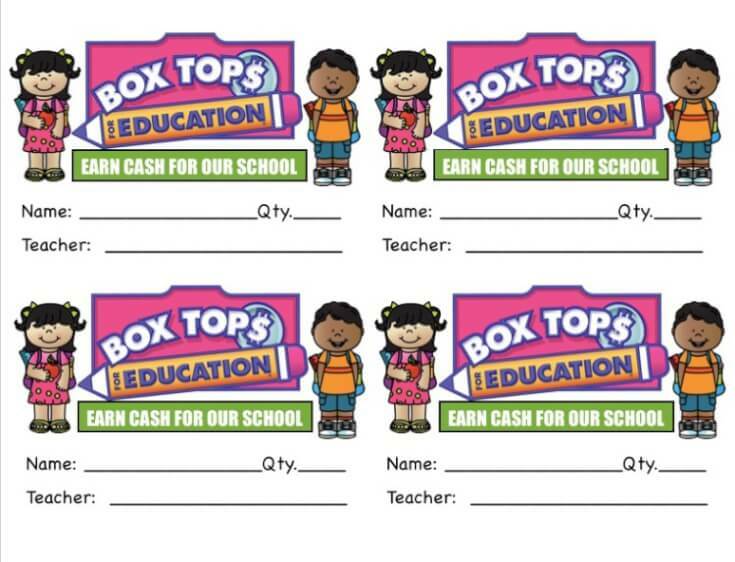 Box Tops for Education equals cash for your school and makes giving easy. Anyone in the community can participate. When you purchase featured General Mills products, Walmart is offering 5 Box Tops. This means 5 times the impact for just buying the products you love! 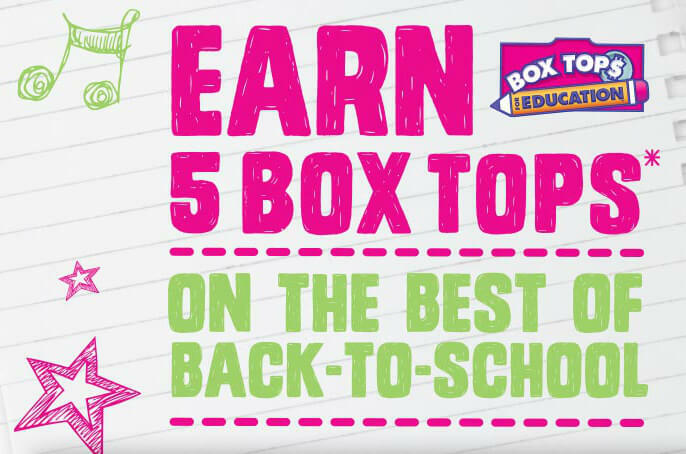 Be on the lookout for extra box top earners – you can find loads online here: Get Box Tops. Just imagine what your school could do with $20,000: school supplies, audiovisual helps, playground equipment, field trips, classroom parties, and more are possible. There are no limitations on the money’s use, so your school can spend the money raised from gathering box tops as needed. Once you’ve finished with the product, cut off the Box Top before you throw the used box away. Be sure to look over the whole box: some packages offer bonus Box Tops. Simply send the clipped Box Tops into your school with your child. I’ve even created a free printable that you can insert into a Ziploc bag to keep everything organized. Click the yellow button to download and print all of the printables I’ve created to help teachers get parent volunteers and gather Box Tops for Education. Now, box tops are one way parents, grandparents and care-takers of children can help their local school, but they’re not the only way to help. Schools often need volunteers to help with a myriad of activities to enrich and enhance children’s educational experiences. Just think – you could be a guest speaker on career day, or help out with a field trip to the zoo. There are so many ways to offer help, and many schools provide the option to help from home too. You may not need to be in the classroom during classroom hours to lend your teacher a helping hand. 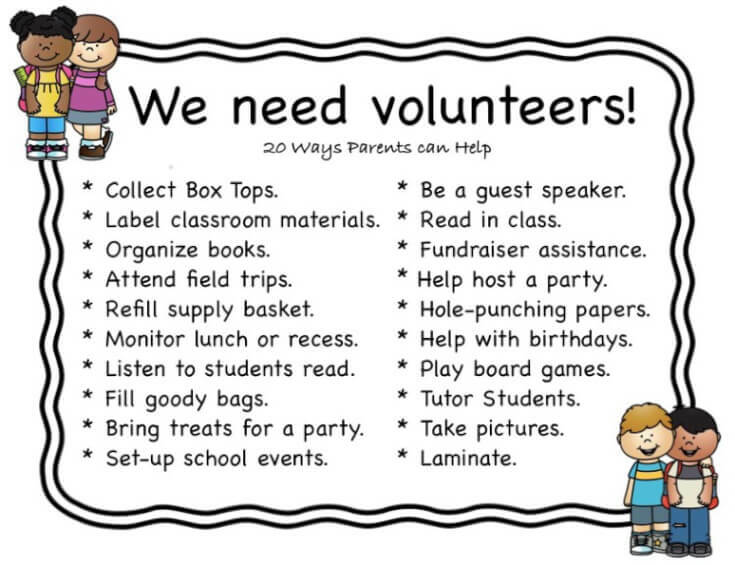 This list of 20 Ways Parents can Volunteer at School is just a list of suggestions. Talk with your teacher about what he or she may need. Teachers: I’ve even created a special form for you. 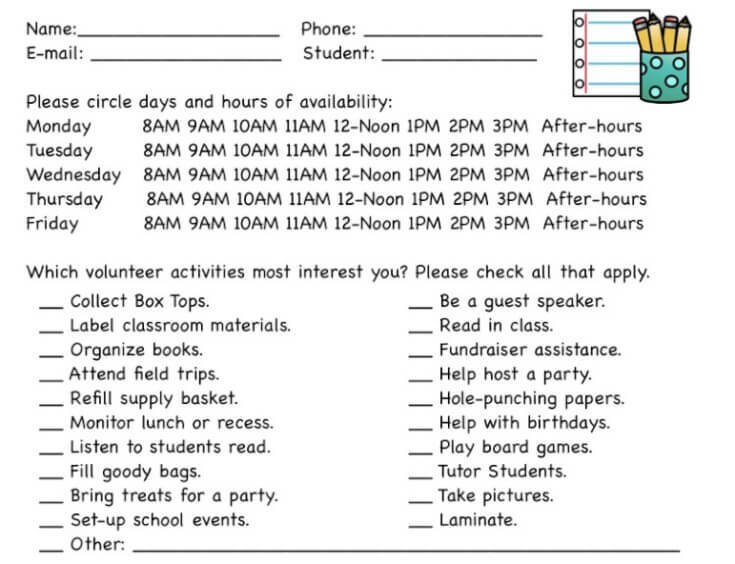 Just print it out and have parents complete the form to let you know what types of volunteer activities that would be most interested in and their times of availability. Too busy to coordinate volunteer help? Ask a parent volunteer to do the coordinating. Use this form to get volunteers for your classroom! If you enjoy kids’ activities for 6 year-olds and under, and easy recipes, follow me on YouTube or find activities in the search bar on my Home Page. How can we do more to help schools? How can we do more to help schools? If you’re a teacher or parent I’d love to hear from you. Do you use the Box Tops for Education program at your school? How much money did you raise? What types of volunteer activities have been most helpful for your school? Please leave a comment below and join the conversation. I love hearing from my readers! Thanks for being a fan! Do you have a board for delicious desserts or party foods on Pinterest? Help spread the word and PIN this post on Pinterest!